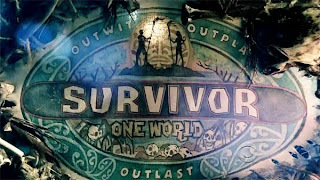 So life on the island got worse for the women: it rained all night after the last Tribal Council, kept them up all night, soaking wet and put their fire out. In the morning, the women ran over to the men's camp to warm up next to their fire, which was protected by their shelter. The reward challenge was a memorization game for a fishing supply kit and a canoe - which would be useful to get back to camp after all the rain. The women got their first victory of the game with a 5-0 rout of the men. When the women got back to camp, they had trouble starting their fire again due to the torrential downpour, and begged the men for an ember to give them a firestarter. The guys did, but fairly reluctantly. The guys wanted to take the canoe out for fishing (after the rain stopped), and the girls were reluctant. Negotiating ensued. Well, the women bickered amongst themselves, they went to commercial and nothing was really settled. The next day, the sun came up and the women went spearfishing with some success. The immunity challenge involved blindfolds, mazes, big pails of colored water and puzzle pieces. The women trailed badly, staged a comeback during the puzzle part of the challenge, and won. They were so happy. Colton relished the idea of going to Tribal and rallied his Misfit Alliance and he dragged Jay into it. They targetted Bill. Matt came along and talked about roosters. So Colton thought maybe getting rid of Matt was the better plan. At Tribal Council, Colton declared he's not going home because he has an idol. Jeff also questioned Colton on why he spends so much time around the women's tribe. After saying he would play the idol, Colton kept it in his pocket. Matt was voted off. And Colton just took charge of his tribe. Next week: A betrayal. ON SURVIVOR!? THE HORROR!